I return to Australia after a month long tour of North America,and what do I find? 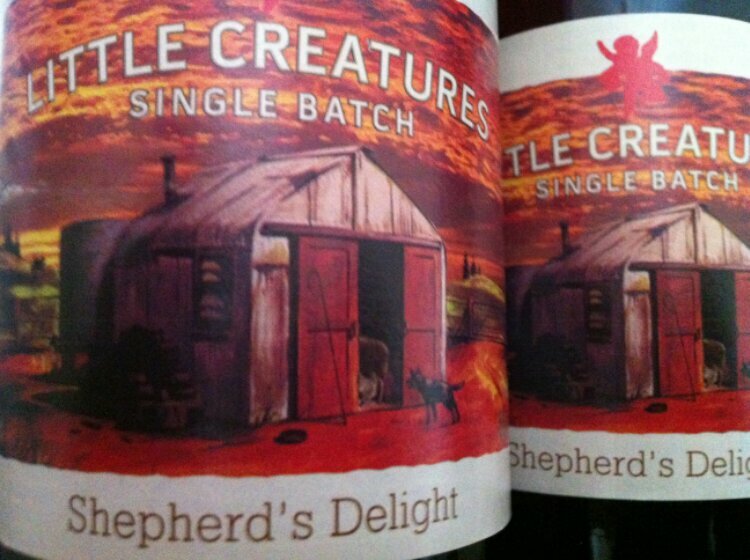 Little Creatures have released the latest Single Batch – Shepherd’s Delight. That’s exciting enough by itself, but what’s even better is the of this particular brew. It’s a Red IPA, which happens to be the same style that’s really popular right now in…North America! So this is another beer that appears to have been brewed just for me…thanks team! As the old saying goes, red sky at night, shepherd’s delight. I have no idea why a red sky is a sign of good things to come, and since I’m not a shepherd, I don’t really care. What I know is that this is also a reference to this beers style – a RED IPA. I hear you…finally, another Little Creatures IPA!! (insert girlish squeal of excitement here) After the success of the Big Dipper, I’ve got very high expectations for this latest offering from the Little Creatures crew. The picture on this label is probably the most evocative I’ve seen, with a brilliant red sunset over the usual single batch shed. Looking at it makes me feel like I’ve done a hard days work on the land,and that I’m very deserving of this beer. And the dog is still there too, watching over what’s happening in the shed, as curious as ever. The initial aroma is the expected tropical explosion, and the flavour kicks off in a similar fashion. Then the malt adds some spice, while an approachable bitterness dries out the palate, leaving the very end with almost a smoky quality. It’s quite a lot to get your head around at first. I’m not sure if I’m happy calling it a ‘red’ IPA though; the colour is more of a deep amber, and the body is much lighter than I expected. Towards the bottom of the glass the malt opens up and throws some sweetness into the mix, and I also noticed some ‘tingling’ on the sides of my tongue. Everything really comes together once it’s warmed up a bit, so do your best not to consume it too quickly. This wasn’t the hop bomb I was expecting, considering the label says that this is their ‘most lavish hopping regime to date‘. I also think calling it a ‘red’ IPA is pushing things, and I’ve tasted a fair few red/amber IPA’s over the past few weeks to compare it too. But I feel like I’m searching for negatives. The fact is that this is more than just a solid beer, it’s damn tasty. Sure, it’s not the Big Dipper, but it was never going to be. It still manages to claim second place behind it’s big brother in my Little Creatures Single Batch ‘Best Of’ list, which is a great achievement. Thanks for the tasting review. It’s such a shame that they were bought out – however hopefully it will mean even wider distribution and more chance for single batches. However I unfortunately doubt this to be the case and assume over time cost cutting will mean cutting corners and a gradual reduction in quality as seen happen to other breweries.